While kale has had its well-deserved time in the spotlight, and coconut water continues to reign supreme, both of them need to make room for the skin-beautifying ingredient many of us have been ignoring — radishes. If you’re not already incorporating this food into your diet, it’s time to start. Here’s why radishes need to be on your plate at your next meal, or even in your next homemade skin mask. The radish (Raphanus sativus) is an edible root vegetable that comes from a plant that’s part of the cabbage family. It’s been around for a long time, though scientists aren’t really sure from where it originated. Wild forms of the plant have been found in Southeast Asia, which may be a sign that they first grew there, but the Greeks and Romans were using them by the third century B.C. It’s believed radishes were brought to America in the 1600s. There are a number of different varieties of the plant, but it’s the spicy ones that we’re most familiar with. Hardy and pest resistant, they include a number of chemical compounds that give them their unique sharp flavor. It’s these chemicals, along with a number of vitamins and minerals, that seem to be responsible for the radish’s many health benefits. 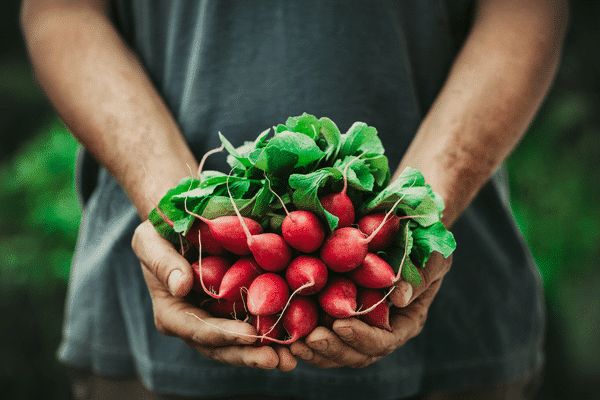 Before we go into how radishes specifically beautify your skin, we want to talk about some of their most potent health benefits. And in the end, what’s good for your health is good for your complexion. A 2008 study reported that radish juice helped inhibit the formation of gastric ulcers, with researchers concluding that it had “gastroprotective” potential—meaning it helped protect the digestive system. Eating radishes before a meal is said to increase digestive power. Beyond that, radishes contain indigestible carbs and are high in fiber, making them a great food to ease digestion, reduce the symptoms of constipation, and limit water retention. Radishes are considered a diuretic vegetable, meaning they promote urination. They also have anti-inflammatory and antibacterial properties, which can help protect against urinary tract infections and potentially encourage healing. There is some evidence that radishes, because of these properties, can also help improve and protect kidney health, and potentially reduce the risk of kidney stones. A number of studies have suggested that radishes may help to protect us against cancer. In 2002, for instance, researchers found that those who consumed more radishes in their diet were at a reduced risk for gallbladder cancer. A 2009 study also noted that radishes contain “isothiocyanates,” naturally occurring small molecules that have the capacity to reduce the activation of carcinogens. Though we know that a diet rich in veggies is protective against cancer in general, the radish has certain antioxidants that may be particularly helpful. The powerful antioxidants in radishes may help protect against high blood pressure. A 2012 animal study found that a radish leaf extract treatment that lasted for five weeks significantly reduced systolic blood pressure. Radishes are a good source of nitrates, which is converted to nitric oxide in the blood—and nitric oxide helps relax the smooth muscle walls of blood vessels so they dilate more freely. Nitric oxide also helps reduce the risk of blood clots. The high water content in radishes is good for your skin as well as other body organs, helping to maintain moisture levels. Radishes also contain both omega-3 and omega-6 fatty acids, which are critical for plumping moisture down in the deeper levels of skin. A cup of radishes will supply you with about 30 percent of your daily recommended amount of vitamin C. As you may know, vitamin C is critical for firming and tightening and protects from environmental stressors. The root also contains vitamin A. If you’re suffering from clogged pores and haven’t found a solution, you may want to try black radish juice or pulp in a homemade mask. Mashed white radishes may also do the trick. The key here is the cleansing property, which can help reduce the appearance of pores. The high water content prevents over-drying. Mix radish juice with a few drops of citrus juice to cleanse skin and clogged pores. Lighten the look of your skin: The vitamin C and A content in radishes, as well as some of its other components, are said to help lighten and brighten the appearance of skin. Mix with yogurt and honey to create a gentle, moisturizing, lightening mask. Did you know radishes were good for skin? Please share any recipes you may have. Wow, thanks for the reminder about radishes. They’re one of those veggies I don’t think of all the time. When I have access to really fresh ones, I love to use the greens in my green drinks. They definitely have a spicy kick! At times I have grown my own radishes. Picking and eating them when they are pretty young means they are a little less spicy. I’m definitely picking some up this week!